Although the decline of 10-year government bonds in Germany weakened Euro, EURUSD is being supported due to the growth of “risk appetite’ in the world. Yesterday despite the pair’s effort to move in bullish bias there were many pullbacks on the way. 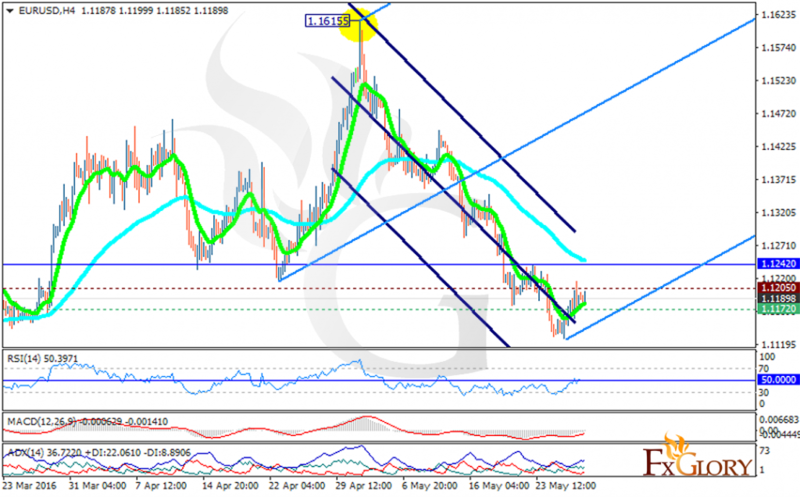 Now the support rests at 1.11720 with resistance at 1.12050 which both lines are below the weekly pivot point at 1.12420. The EMA of 10 is moving below the EMA of 75 suggesting the price movement in lower ranges in recent days. The RSI is getting above the 50 level, the MACD indicator is in neutral territory and the ADX is showing strong buyers. Unfortunately there is no strong signal for traders at the moment; however the pair may continue its upward trend within Andrews’ pitchfork. If traders cannot wait for a better chart setup, long positions are recommended with the target at 1.1300.